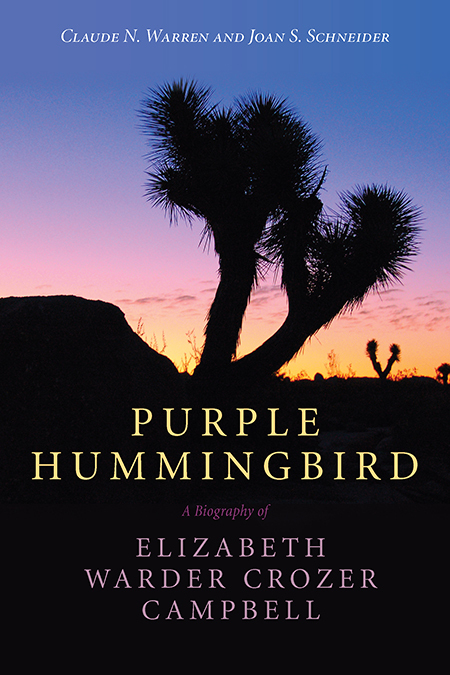 Elizabeth Warder Crozer Campbell and her husband, William Campbell, found themselves forced to move to the Mojave Desert in 1924, its dry climate proving to be the best for William’s frail lungs burned by mustard gas in World War I. They camped at Twentynine Palm Oasis in what is now Joshua Tree National Park, homesteaded nearby, and became a central part of that early community. Life in the remote, stark landscape contrasted sharply with Elizabeth’s early years of wealth and privilege in Pennsylvania. Her resilient spirit made the best of what at first seemed like a bleak situation: she became an amateur archaeologist and explored the desert. A keen observer and independent thinker, she soon hypothesized that prehistoric people had lived in the California deserts along the shores of late Pleistocene lakes and waterways much earlier than was then believed. She devised a means for testing her hypothesis and found evidence to support it. Her interpretations, however, conflicted with the archaeological paradigm of the day and she was dismissed by formally trained archaeologists. Even so, she and her husband continued their work, convinced of the accuracy of her findings. Four decades later the archaeological establishment validated and accepted her ideas. Campbell’s research ultimately revolutionized archaeological thought, forming the basis of today’s landscape archaeology. Claude N. Warren is Distinguished Professor Emeritus at the University of Nevada, Las Vegas. Joan S. Schneider is recently retired from her position as associate state archaeologist with California State Parks. 1. Why a Biography of Elizabeth Campbell?